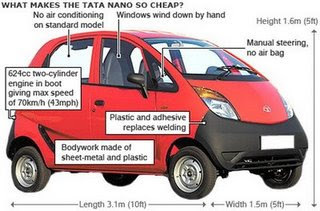 Tata Motors has unveiled the world's cheapest car on January 10 at car show in Delhi.The exziting thing about Nano is that it comes with a price tag of Rs.1,00,000.The nearest price competitor is the Maruti 800 which costs as twice as the Nano.Another exziting aspect is that it is 21% larger than Maruti in terms of seating capacity. The four door Nano is a little over 10 feet long and nearly 5 feet wide. It is powered by 623cc two cylinder engine. With 33 horsepower,the nano is capable of 65 miles per hour. There is a small trunk, big enough for duffel bag. Its four wheels are the absolute corners of the car to improve handling. "TATO NANO HAS BEEN NICKNAMED AS PEOPLE'S CAR"
The unveiling of the Tato Nano, the new car that costs about $2,500. The car is built in India and will bring affordable transportation to the masses. If everyone drove a Tato Nano and all the nations of the world agreed to set the speed limit to 30 miles per hour there would be a lot less pollution. ;) I imagine that everyone freaks out when they think of a 30 mile per hour speed limit, but believe me people would eventually adapt. They would move closer to their work, plan their trips so they could maximize efficiency and in the end their lives would be essentially the same.